U.S. stocks ended the day higher Tuesday as investors welcomed a batch of strong corporate earnings and digested the latest inflation data. The Dow Jones industrial average added 0.9%, while the S&P 500 and Nasdaq increased more than 1%. Better-than-expected earnings from several companies drove the gains. Goldman Sachs (GS)' profit and revenue for the third quarter topped expectations, while Johnson & Johnson (JNJ)'s quarterly earnings also beat analysts' estimates. Mattel (MAT)'s profit exceeded forecasts and revenue rose for the first time since last year, while UnitedHealth (UNH) delivered robust third-quarter earnigns and raised its full-year outlook. 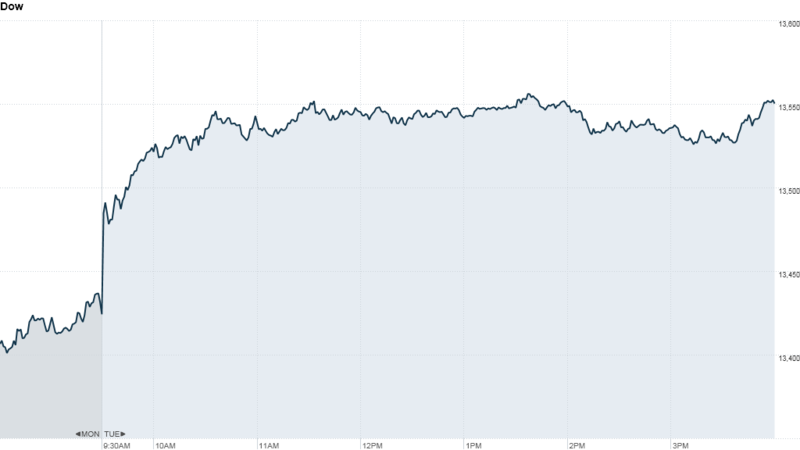 But Citigroup's stole the spotlight with its unexpected announcement Tuesday that CEO Vikram Pandit is stepping down. Michael Corbat, who previously served as Citi's CEO of Europe, Middle East and Africa, was named as his replacement. Citigroup's president and chief operating officer, John Havens, also resigned. Shares of Citigroup (C) rose 1.6% following the surprising shakeup at the top. Meanwhile, the September reading of the Consumer Price Index, the government's key metric for inflation, rose 0.6%. That's higher than the 0.5% increase that economists polled by Briefing.com had been expecting. Compared to a year earlier, prices have risen 2%. Based on this data, the Social Security Administration announced that recipients will receive a 1.7% cost-of-living increase in 2013. Industrial production rose 0.4% in September, according to the Federal Reserve. The reading was better than analysts were expecting. Companies: Shares of Murphy Oil (MUR) rose sharply higher after the company said it split into two separate companies, separating its exploration and production operations from its retail business of selling gasoline. Coca-Cola (KO) shares slipped after the company missed revenue forecasts. Fossil (FOSL) shares jumped after an analyst at Citigroup upgraded the stock to a buy rating with a $100 price target, up from netural. After the market close, Intel (INTC) reported earnings that beat Wall Street's expectations, but fell from a year ago. Shares slipped in after-hours trading. Also after the closing bell, IBM (IBM) posted earnings that topped forecasts by a penny, but revenue fell short of expectations. Shares declined in after-hours trading. World Markets: European stocks ended sharply higher. Britain's FTSE 100 rose 1.2%, the DAX in Germany added 1.6% and France's CAC 40 jumped 2.1%. Asian markets ended mostly higher. The Shanghai Composite finished flat, the Hang Seng in Hong Kong ticked up 0.3%, and Japan's Nikkei climbed 1.4%. Currencies and commodities: The dollar slipped against the euro and the British pound, but gained versus the Japanese yen. Oil for November delivery rose 24 cents to settle at $92.09 a barrel. Gold futures for December delivery rose $8.70 to settle at $1,749.20 an ounce. Bonds: The price on the benchmark 10-year U.S. Treasury fell, pushing the yield up to 1.73% from 1.66% late Monday.